that was unearthed at Kincaid Park, Anchorage, Alaska. Kincaid Park is located on a large parcel of land southwest of Anchorage that was previously named the Point Campbell Military Reservation. During much of the Cold War years, the primary facility in the area was a Nike-Hercules air defense missile battery that was constructed in 1959 and remained in operation until it was deactivated in July, 1979. Shortly thereafter many of the primary buildings were torn down and the land placed under the control of the Municipality of Anchorage. One of the highlights in the history of the site was the Great Earthquake of March, 1964. At that time, the missile site suffered severe damage and most of the missile inventory was damaged beyond use, resulting in a situation of extreme danger to the personnel as well as the surrounding area. The earthquake and its effects on the site were very traumatic for those stationed there, who were subsequently tasked with stabilizing the situation and restoring the site to operational status. 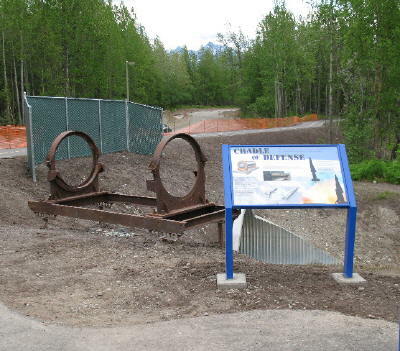 If you would like to learn more about the history of Kincaid Park and the men and machines that defended the Anchorage area through the height of the Cold War, please CLICK HERE. If you would like to learn more about the other Alaskan Cold War missile sites, please CLICK HERE. The missile site was divided into two main areas; on the highest ground was the Integrated Fire Control area which consisted of the radars and living quarters, and on the lower ground closer to the inlet was the Launcher area where the missiles and launcher buildings were sited. One of these launcher buildings is now known as the Kincaid Chalet and is continually used for weddings and other community events. Along the north side of the road between these two areas were two storage bunkers that may still be seen today. In October of 2005, while bulldozing a new trail for the park about 30 yards south of the road between the two areas, one of the fins from the booster stage of a Nike-Hercules missile was unearthed along with some other twisted steel parts. A man involved with the find reports that "The fin and other stuff was found roughly 40-50 yards south of the bunker...on the south side of the road, perhaps no more than 30 yards from the road." These steel assemblies have been identified as part of the packaging material used to transport missile parts to the site. The best information at this point suggests that they were part of the packaging for replacement sustainer motors (the rocket motor inside the main missile itself). So, why the big deal over some scrap metal? 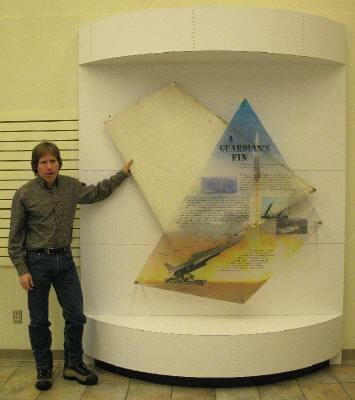 It was immediately theorized by the man that first recognized the fin for what it was that this may have been buried at the time of the Great Earthquake in 1964, and as such could represent a tangible relic of significant historical value. The problem now is: How do we determine the time that this fin was actually lost? At the time of construction of the site in 1959. At the time of the Great Earthquake of 1964. At the time of site deactivation in 1979. At some other date during normal battery operations. We can reduce this number somewhat by assuming that the fin was buried at the same time as the shipping cradles that shared its grave. The cradles were only needed at the time of initial supply of the site's inventory, and at the time that the inventory was replenished in 1964. No missiles were ever fired from this site so there is no reason to believe that replacements were ever required at any other time. As we will read below, these shipping cradles were expensive and were accounted for and returned through the supply chain. Normal operations would not leave cradles laying around to be buried later.Therefore, the likelyhood that the cradles were used at some time in the course of normal battery operations is remote and can safely be discounted. One might assume that shipping cradles were required at the time of deactivation in 1979 when the missiles were removed, but it is very unlikely that any but the required number of cradles for the closely-monitored inventory of missiles on hand would have been delivered to the site. We can therefore delete the 1979 date from our list of possibilities with relative certainty. The time of the Great Earthquake of 1964. Other testimonial and circumstantial evidence should point toward one date or the other. A call went out for information as to the probable history of these buried items, which resulted in the information collected below. A man very familiar with the operations of the site, the Battery Commander during the 1976-77 timeframe notes: "I would suspect the fin is a part of the 64 debacle. I wouldn't even hazard a guess to where the fin had come from if that wasn't the case." "Following the earthquake, my initial responsibility was emergency disarm and isolation and making safe of all rounds. Every one of our missiles was damaged and required tear down and replacement of parts. We were able to salvage some parts (for example, the booster cluster fins) but many rounds required complete replacement of all parts. Warheads, rocket motors (main and booster) were all replaced." "We went through lots of inventorying of the damaged and replacement parts so it's hard to visualize how we could have missed one of the fins that was attached to the rear of a booster cluster...However, it isn't hard to visualize the packing and shipping hardware getting left behind. Certainly, there was accountability for the packing and shipping hardware, but nothing like the accountability for the missile components. My recollection is that the individual parts had serial numbers and I think that would include the fins." This begs the question, why would a fin, a serialized part of a closely inventoried piece of ordinance be discarded in the first place if it were not damaged goods? 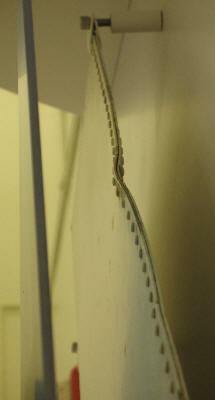 Here is a photograph of some of the damage this fin sustained. This is sufficient to disqualify it from flight. "We had zero observation and assistance from outside the battery during the first 72 hours..."
"The experts were not with us during the initial days immediately following the quake - they arrived as replacement parts began to arrive..."
"We had teams from Redstone Arsenal and Sandia who assisted and thoroughly documented all the tear down effort. Even used up several cases of Polaroid film. Best I can recall, the team of engineers from Redstone and Sandia were with us for a month or so, until all of the damaged missiles were torn down." Could something like a damaged fin have been thrown aside and later slipped through the cracks in the initial days of recovery? What about other items of clutter that may have been in the way as the effort to get the site back up and running - like the shipping cradles of the inital replacement parts to arrive? He further states: "I don't think [burial of the metal cradles] would have happened when the site was first built because there probably was more deliberate control over everything that was going on. Not so, following the earthquake....Only those aspects requiring the most strict control would have received the meticulous handling normally associated with all the military stuff...In other words, First would be the warheads, then the other missile components, and finally any shipping materials." "For reference... one of the senior NCOs had homesteaded close by [another of the missile sites] and he had built his homesteader cabin out of the (wooden) crating materials that the boosters were shipped in. I didn't ask if there were any special provisions regarding local use of the wooden crating materials. However, the metal shipping materials were returned through supply channels." "All the bent and rusted metal [in the photos above] was but a small amount of the packing and shipping materials used to bring the new and replacement parts to the site during our rebuild period. What I saw in the trash pile photos wouldn't account for all the missiles we had and what was replaced. I think these just got left behind in the confusion of the time [of the earthquake]. "Do you remember what would happen to unauthorized equipment or parts before an IG or CMMI? Maybe that was a forgotten stash." "I also took a picture of reddish stains on the fin... It almost looks like stains from something on possibly rubber gloves that picked up the fin. What would make reddish stains? One possibility is hydraulic fluid. The main part of the Hercules missile itself is controlled in flight by hydraulic actuators that move the "ailerons" on the trailing edge of it's fins. The fins on the booster section however (which is what was found) are fixed and normally would be nowhere near the hydraulic system of the upper main part of the missile; but it is no stretch in the mind's eye to get hydraulic fluid squirting all over the place in the violence of the earthquake event. The launchers are powered by hydraulics too. It is highly probable that gloves worn by someone engaged in cleanup operations would have hydraulic fluid on them. "Missile fluid was red, and if memory serves me the launcher [fluid] was a reddish orange." "The solid propellant in the booster was red as well. It could be a possibility that if some of the [broken up booster] fuel was buried or mixed in the debris it may have left the stains as well. I recall many times picking up pieces of solid fuel that was thrown from the boosters after lift off." 1. The earthquake wrecks the missiles and other equipent; solid fuel boosters are split open and hydraulic fluid leaks/squirts/spills. 2. During subsequent cleanup operations this fin is picked up by a GI using gloves stained with solid fuel or wet with hydraulic fluid from other handled parts and it is tossed into a scrap pile, perhaps by mistake. 3. The first of new missiles and parts are brought to the site and the shipping cradles are hurriedly tossed in the junk pile on top of the fin where it is forgotten about, being out of sight under the other debris. 4. With the other items having been previously inventoried and shipped out or otherwise dispositioned, this particular junk pile is buried separately in final cleanup operations days or weeks or years later. 5. Forty-one years pass and the fin is inadvertently unearthed by trail construction. It is true that there are a few key assumptions made in constructing this scenario, but the purpose of this article is to present the evidence that shows why it is possible, if not probable that the fin is a remnant from the 1964 earthquake. It does not, however, present all other possibilities. There is yet further evidence that could help to narrow down the possibilites. The photograph of the fin below records a stamped serial number as well as a stenciled lot number on the fin. This could serve to confirm whether the fin was present on the site prior to the day of the earthquake, or only afterward. "Above mentioned junk wasn't buried when I got there in 8/73. I climbed all over it. Use to hunt snowshoe rabbits between launch area and bunker on south side of road. Was informed at that time by some oldtimers it was indeed left overs from earthquake in 64. When I left in 8/77 junk pile was covered over with vine maple which was a big problem in the area. I don't recall what ever happened to that dump ground but I do remember every time there was an inspection one of our deuce and a halfs [large truck] was filled with unauthorized equipment and drove over to that area for the day, then brought back and unloaded after the inspection.... [it] was a dumping ground for all sorts of Junk from the Btry." Thanks to the efforts of the fin finder (at left below) and the Municipality of Anchorage, the fin is now on public display at the Kincaid Park Chalet, which is one of two buildings where it resided once before; bolted to a Hercules missile booster, ready to engage an attacking Soviet aircraft. It is home again. One of the unearthed sustainer motor cradles is on display adjacent to a bike trail nearby. All photos courtesy the fin discoverer. Many thanks! CLICK HERE to return to the NIKE-HERCULES ALASKA INDEX page.